The new year, in our modern world, begins in the dead of winter, at a time when vegetation is in hibernation, and growth is at a standstill. With the Biblical calendar, this is not so, for Yahweh has legislated in His Word that spring (the time when life is renewed on earth) is the time to begin our year. This month shall be unto you the beginning of months; it shall be the first month of the year to you, Exodus 12:2. This is a direct command from Almighty Yahweh, given to show us the method whereby we shall reckon Scriptural time. In Exodus 13:4 we are told that this month is called "Abib." From Gen. 7:11 and 8:4, we learn that the months at first were numbered, and later the names were added. Time has been divided by Yahweh into rhythmic cycles of days, weeks, months and years. The re-creation of the earth's surface in Genesis 1 shows that the division of light from darkness brought about the day and night, verses 3-5. In verse 14 we learn that luminaries were placed in the heavens, not only for days and nights, but to determine the things to come, seasons and years. In the religious realm, man has used various devisings of his own mind to arrive at the determination of Yahweh's Holy Days. Most enlightened people reverently strive to keep the seventh-day Sabbath. And although a few may question the historical accuracy of the seventh day which is handed down to us, we can prove through secular history that the seventh day has been maintained since the times of Yahshua the Messiah. Certainly He knew which was the seventh day. He said He was Master of it! It was the Council of Nicea which established the pagan "sun-day" as the day of worship over the sanctified seventh-day Sabbath, which was kept by Yahshua and all the patriarchs before Him. We have only to go back to the year 321 C.E., when Rome transferred the day of worship from the weekly Sabbath to the "venerable day of the Sun." The leaders of Rome knew which was the correct seventh day, but "transferred" the holy day of obligation from the seventh to the first day, some 300 years after Yahshua's resurrection and most of the worldly churches have followed meekly after Rome in keeping Sunday. The striking of the blood upon the lintel of the Israelites dwelling in Goshen in Egypt had to be done on the proper day, if the firstborn were to survive, Exodus 12. Had the Jews, "out of every nation under heaven," not been devout and kept Pentecost (Shavuoth) at the proper time, they would not have witnessed the pouring out of the Holy Spirit upon the favored 120 disciples who were all with one accord in one place, Acts 1:15 and Acts 2:1. We, who are living on this side of Calvary, must carefully determine the exact days when Yahweh says He will meet with His people at His appointed times. Ezekiel chapter 20 gives the history of Israel's disobedience in not keeping Yahweh's judgments and statutes, and did pollute His Sabbaths. In verses 12 and 20, Yahweh says that He gave His Sabbaths for a sign between Him and His people that they might know that He it is that does sanctify or set apart His people for a holy purpose. These days are very special to our Heavenly Father. He will prove to His people one day that He is the One Who has supreme power when His supernatural protection of His people proves that He is the Mighty One of Israel. We believe that those obedient followers of Yahshua will be spared just as were the children of Israel on Passover night, if we are diligent and keep His set times on the CORRECT DAY! “The primitive calendar month of the ancient nations began on the day of new moon or the day after, and thus coincided (except for fractions of a day) with the synodical month. Among many peoples of antiquity, however, it was from a very early period found desirable that the calendar year should contain an integral number of small periods used in ordinary reckoning. Hence, the true ‘months’ were superseded by a series of twelve periods, each having a fixed number of days (on the average one-twelfth of the number in the calendar year), and thus having no relationship to the change of the moon, but this artificial period continued to bear the name ‘month.’ In the Julian calendar, the months in leap year alternately 31 and 30 days, while in other years February had only 29 instead of 30. This symmetrical arrangement was under Augustus broken up by a transference of a day from February to August, and a day from September and November to October and December, respectively, producing the system now in use." Other calendars have been advanced from time-to-time, such as the solar calendar, which is based on the sun. The very fact that the root meaning of the word “month” is based on the moon or lunar cycle shows that any calendar based on solar reckoning is wrong. (Remember, month is defined as a measure of time corresponding to the period of revolution of the moon, Oxford English Dictionary). A true month as taught in the Scriptures begins with a little sliver of light (scimitar shaped) in the rebuilding phase and progresses to the first quarter, full moon and last quarter averaging 7.38 days apart. The problem in determining a calendar has its basis in the difference between the solar year's 365 days and the lunar year's 354 days. The difficulty lies in reconciling 12 lunar months that fall 11 days short of 365 days of the solar year. No matter which calendar is followed, approximately every third year will have 13 new moons or 7 additional months in a 19 year period known as the metonic cycle (named after Meton, the Athenian astrologer). It was at the Council of Nicea in 325 C.E. over which Emperor Constantine presided, that the decree was given that "the church" would no longer look to the Jews to see when the celebration of Easter should be held. It was here that the vernal equinox was established as the starting point to reckon this spring celebration. The festival of Easter should be celebrated on the Sunday after the full moon which occurs next after March 21, the vernal equinox. Emperor Constantine was unbaptized and grossly ignorant of the religion of Christianity over which he was presiding. He had no comprehension of the Hebrew faith and the Messianic worship. His main concern was to unite his kingdom at all costs, and especially the religious factions that were at odds in his realm. It is from the Council of Nicea, presided over by a pagan ruler, with decisions and decrees from worldly leaders of the religion of that day, that the corrupted Messianic worship was given the formula for observing Easter! Rome, since that time, has passed this golden cup of fornication to organized churchianity which has drunk deeply of pagan observances now made a part of church worship. For example, Easter, Lent, St. Valentines, Halloween, Xmas, New Year, Sunday. . . all have their roots in pagan idolatry. In spite of this, there are still religious groups that determine the time to observe Yahweh's Holy Days by relying on the vernal equinox! Nowhere in your Bible can you find any Scriptures, whatsoever, telling anyone to look to that time when day and night are equal for the point to begin the Scriptural year. Yet, many sincere misguided people look to the rules from an admittedly paganized religious group to determine when to hold Passover! Some point to Genesis 1:14 and try to twist this verse to say the luminaries in the heavens are here referring to the equinox, to tell us when these signs are for seasons, days and years. This self-same verse could just as well refer to the winter solstice, the summer solstice, the autumnal equinox or any other sign, as well as the vernal equinox. Nowhere does your Bible direct us to look for the vernal, autumnal, or any such sign, as an equinox or to see when day and night are equal. This is simply the rules and traditions of man, handed down from the Council of Nicea. From the Oxford English Dictionary we learn that the Macedonians reckoned Dius their first month from the Autumnal Equinox. It is evident that Rome took the spring or Vernal Equinox to establish their reckoning to Easter and thereby would not have to look to the Jews or any religious group to determine the celebration of Easter worship. The word "vernal" has to do with spring. Equi- nox refers to that time when the sun crosses the equator which it does both March 21 and again September 22 or thereabout. The vernal equinox can be traced back to Egyptian sun worship, and is in the same category as the Saturnalia, from which stems the Christian winter celebration. It is evident to the sincere Bible scholar that many worldly religious activities are closely patterned after those customs found in paganism and idolatrous worship. We are committed to root out vestiges of paganism that contaminate Yahweh's pure worship, and to turn to the Bible as our guide. Therefore, we cannot use the venal equinox to mark the beginning of the Passover season. The method Yahweh gave His people to determine His Holy Days applies to us today as well as to the children of Israel when they entered into the Promised Land. The same instructions for keeping His days applies to you and to me as it did to King David when he was still a young shepherd lad on the hills of Palestine. The method commanded to determine when to hold these convocations could not be so complicated that accurate chronometers and watches of today would have to be used to note the exact time when day and night are equal. Surely, the people in King Hezekiah's time (II Chronicles 30) were able to tell when to keep Passover without having to note the subtle difference of seconds of time to see when day and night were each of 12 hours duration. Yahweh's law applies to the primitive society as well as to the supposed sophisticated people of today. It is an inspired Book for all ages. Abib must be that month in which the green ears appear. Following the directions given in Deuteronomy 16, an Israelite would note the New Moon in the beginning of Spring and check the barley fields for the appearance of heads of grain. If he found the grain short, and no heads in forming, he would wait until the next new moon. Then, he would again check the barley fields and when he noted heads of grain, he would know this was the month of Abib when he could garner an orner (handful) of ears to be presented the day after the weekly Sabbath during the Days of Unleavened Bread. Yahweh's holy days are closely tied to agriculture and the crops of the fields. Pentecost and Tabernacles are both harvest celebrations and give us a deeper insight into Yahweh's Divine plan. Psalm 104:10 -14 shows that it is Yahweh Who provides the earth with water and the proper growing conditions. We are fully dependent upon Him for our survival and our blessings as well. Every good gift and every perfect gift is from above, and cometh down from the Father of lights, with Whom is no variableness, neither shadow of turning, James 1:17. It is no wonder then that we are to watch for that month in which the barley heads appear. It is a type of still future spiritual harvest. Then saith He unto His disciples, The harvest truly is plenteous, but the labourers are few; Matthew 9:37. Observe the month of Abib, and keep the Passover unto Yahweh thy Elohim: for in the month of Abib Yahweh thy Elohim brought thee forth out of Egypt by night, Deuteronomy 16:1. We should strive to let the Scriptures teach us and be our guide. The Bible is an ageless Book, and its lessons apply to us as well as to the Israelites of old. That is the reason that we go by the visible new moons to establish the proper time to keep Yahweh's Holy Days. All good Bible scholars agree that Yahshua is going to return and set His feet upon the Mount of Olives. And His feet shall stand in that day upon the mount of Olives, which is before Jerusalem on the east, and the mount of Olives shall cleave in the midst thereof toward the east and toward the west, and there shall be a very great valley; and half of the mountain shall remove toward the north, and half of it toward the south, Zechariah 14:4. The law will go forth from Zion and the word of Yahweh from Jerusalem. And many people shall go and say, Come ye, and let us go up to the mountain of Yahweh, to the house of the Elohim of Jacob; and He will teach us of His ways, and we will walk in His paths: for out of Zion shall go forth the law, and the word of Yahweh from Jerusalem, Isaiah 2:3. If we are to be a part of those worthy of the first resurrection, Rev. 20:6, we should strive to be in complete harmony with the Kingdom Laws by which the world will then be ruled from Jerusalem. Yahshua will be keeping the same Holy Days then as we have in our Bible now. Mortal man's preferences, desires, and ideas will have no weight on Divine rules which have been before ordained that we should walk in them. For we are His workmanship, created in Messiah Yahshua unto good works, which Yahweh hath before ordained that we should walk in them, Ephesians 2:10. Therefore, we strive to keep the same days that come first to Palestine, and then move westward to America some 6 or 9 hours later, depending upon the local time zone. We find that the new moons at times present a problem because on occasion the sun will still be high in the sky and so bright that it blots out the slim, silvery scimitar-like new moon. However, Yahweh’s people should depend upon a visible new moon to establish the proper times of Yahweh's Holy Convocations. Also, we keep in close contact with observers throughout the world. The statement is sometimes made that Yahshua the Messiah followed the Hebrew calendar in His sojourn here upon this earth. Secular history shows that this is not the case at all. When the Messiah walked the roads of Palestine, religious observances were dependent upon the visible sightings of the new moons just as we are to do today. "There was no fixed calendar till the 4th century and the New Moon was declared from actual observation ... After the 4th century the New Moon was no longer fixed by observation, but the Karaites restored the older custom." "By the middle of the 2nd Century, the calculated calendar was on the way to acceptance, but it was not fully adopted till the 4th Century under Hillel II. In the intervening period the proclamation of New Moon and of the intercalary months was still dependent on the evidence of eye-witnesses as to the re-appearance of the moon on the one hand, and the relation of the lunar months to the solar sesons on the other." "According to Maimonides, the Rabbinists altered their method when the Sanhedrin ceased to exist, and have ever since determined the month by astronomical calculation, while the Karaites have retained the old custom of depending on the appearance of the moon." It is quite evident from secular history that during the time of the Messiah, months were determined by actual observation of the New Moon, and continued so for over 200 years. Not until after the dispersion of the Jews did Hillel II make available the present-day Hebrew calendar. The present Hebrew calendar published in 359 C.E. by Hillel II has many rules and changes that are not Scriptural. It contains rules not followed by our Savior, and many were added after Hillel's death by the Pharisees to make their calendar "more relevant to the people." Even today, the Jews keep two days as a guard against being in error in their observance of the Holy Days. This duplication of Holy Day observances is not commanded by the Bible, so in effect the proponents of the Jewish calendar are not following it. Any good reference work will show the areas where the Hebrew calendar makes rules that are nowhere found in the Scriptures. The very first we come across is that the Hebrew calendar begins its year in the autumn! Rosh Hashanah (new year) begins on the day of Trumpets, the first day of the seventh month! Yahweh declares in His Word that the month of Abib in the spring is the beginning of the year to His people. We are to begin our year in spring when the earth is green and coming to life again after winter, and not in the fall of the year at the completion of the year's harvest! "The New Year cannot begin on a Sunday or a Wednesday, or a Friday. The last two days were excluded because otherwise the day of Atonement (the 10th of Tishri) would fall on a Friday or a Sunday ... "
Arthur Spier's The Comprehensive Hebrew Calendar shows there are four DEHIOTH (postponements) governing the day of Rosh Hashanah. The statement is made that "Rosh Hashanah, the first day of Tishri, must be on the day of the Molad (conjunction)." Then we read under the section dealing with the postponements: "Note: In more than 60 of all years Rosh Hashanah does not occur on the day of the Molad but is postponed accordingly to one of the Dehioth. Therefore the Dehioth are actually not the exceptions to the rule but the rule." (Emphasis ours). Here we have the frank admission of the proponents of the Hebrew calendar that the man-made rules of governing the days when a Holy Day will fall is actually more of the rule than the exception. Man has changed the rules and follows his own rules and traditions. 3. Passover can fall only on Monday, Wednesday, Friday or Sabbath. Additionally, the Hebrew Calendar is wrong on Pentecost, which must always occur on Sunday. (Send for our free booklet: Biblical Holy Days). Nowhere does your Bible say that any such rules guide the days upon which Yahweh commands us to set apart for the worship of Him! These are strictly the rules of men and traditions handed down to us from man. Therefore, we must reject the Hebrew Calendar as being the traditions of man, and is not inspired. We must be faithful to the instructions given in the Word of Yahweh and not allow man-made rules to distort or change the days legislated by Yahweh in the Bible. Certainly, the Messiah, in setting up His Kingdom in the years ahead, will use the New Moons to determine the proper months. He will not follow the ideas of man. But, some ask, did not the Messiah follow the calendar of modern Judaism when He was here upon this earth? Certainly, if He followed that calendar, then we should follow in His footsteps. But did Yahshua follow a calendar with all of the man-made postponements which would make it difficult for a simple peasant on the hills of Galilee to know when to keep Yahweh's Holy Days? As stated before, the Hebrew Calendar was made known in 359 C.E. to announce the Feast days to the scattered Jews following the dispersion. We read in many authoritarian sources that the early determinations were made upon visible sighting of the new moons. "The beginnings of the months were determined by direct observation of the moon. The new months were sanctified and their beginnings announced by the Sanhedrin, the Supreme Court in Jerusalem, after witnesses had testified that they had seen the new crescent and after their testimony had been thoroughly examined, confirmed by calculation and duly accepted," Historical Remarks on the Jewish Calendar, Spier. "In all probability therefore, its duration was calculated about the 8th century C.E., i.e., at the period in which the Jews in the East began to study astronomy, and became acquainted with the Almagest," Calendar, Jewish. Here, therefore, we find a corroboration of our theory that the constant calendar of modern Judaism is of relatively late date. "In the late Second Temple times (i.e., 1st century B.C.E. to 70 C.E. ), calendrical matters were regulated by the Sanhedrin, or council of elders, at Jerusalem. The testimony of two witnesses who had observed the New Moon was ordinarily required to proclaim a new month ... Jewish persecution under Constantine II (reigned 337 - 361) and advances in astronomical science led to the gradual replacement of observation by calculation." There are many proofs that the fixed, calculated calendar was not used to set the dates of the Sacred Year. Rather, the calculated calendar was used as a check and verification to document the visual new moon sightings. At times the Samaritans built fires upon the mountains to confuse the Jews who used this as a sign that the New Moons had been sighted. Later, messengers had to be used to verify the sightings. Historical evidence shows that this was the case during the time of our Savior. The calculated calendar with all its man-made rules and postponements was not governing the determination of the Holy Days. Visible sightings, confirmed by the calendar, are used today, just as was done in the Messiah's time. This is the reason there may be a difference of observance from other groups who still go by the man-made Hebrew calendar for their reckoning of Holy Days. Included in the Jewish calendar are some days of celebration that commemorate an important event in the history of Israel that are not commanded by Yahweh. An example of this is the Feast of Dedication which occurs on Chisleu 25, following Ezra's cleansing of the Temple after its defilement by Antiochus Epiphanes. We read in John 10:22 -23 that Yahshua was walking in the outer eastern corridor of the temple, known as Solomon's porch. It should be pointed out that even though Yahshua was walking in Solomon's porch, there is nothing here to indicate that He was in any way joining in the celebration or preaching on this occasion. We cannot say that Yahshua recognized the Hebrew calendar because He was walking in Solomon's porch in the winter, during the Feast of Dedication, which occurs in the month of December. There is nothing here to indicate that He recognized this Feast at all. Tomorrow is the new moon, 1 Samuel 20:5, 24, 27. Even today, we are aware of the beginning of a new month when we are in the 29th or 30th day. We can prove that the calculated calendar was NOT used to set the days of Yahweh's Appointed times until after 70 C.E. In summary, we have to reject the vernal equinox as a method of reckoning, for it has been handed down to us from paganism and is not Scriptural. Nowhere are we told to look for the time in the spring or autumn when day and night are equal. Neither can we accept the Hebrew calendar with all of its manmade rules and postponements which are nowhere found in the Bible. We must return to the Scriptural method of watching for the green ears in the spring of the year at Jerusalem. That month when the green ears appear in the month of Abib, or Nisan, and commences the first month of Yahweh's holy calendar, we find this to be the Biblical way, and the method that will be used when Yahshua sets up His Kingdom which might be but a few years from now. This is what this life is all about — we are in training for a position in the Kingdom! How about you? Are you willing to make the effort to be Scriptural in obeying Yahweh's commands so that you will be accounted worthy to walk with Yahshua in white? It may mean going directly opposite to the teachings of the world and even against the traditions of a man-made calendar. It is imperative that we diligently seek out the truth in Yahweh's Word and then ask for His guidance in strengthening us and leading us out of the confusion of man's rules and follow the Bible as our guide. Begin today to search out the truths so long ignored by the world. 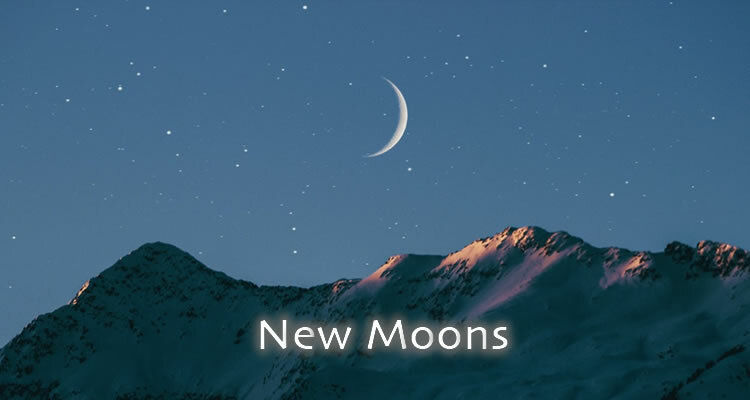 Join us in watching for the Biblical monthly new moons!